The WIAMIS 2004 workshop will be held at the IST Congress Center. 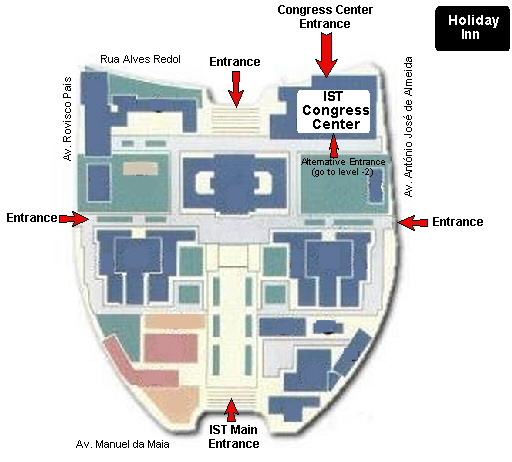 The Congress Center is located in level -2 of the Civil Engineering Building, inside the IST campus - see map below. 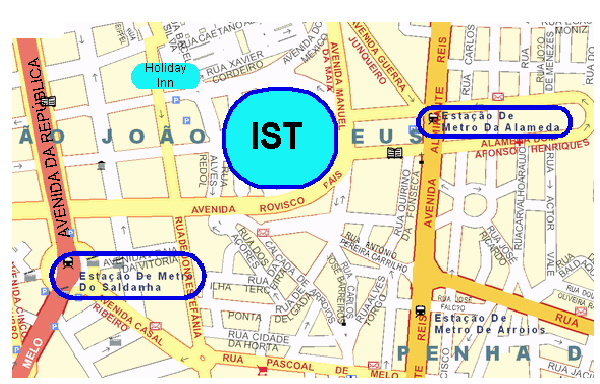 See maps and streets of Lisbon. Lisbon Airport is located about 5 km to the North of the IST area. You may use either the Airport bus or Taxi. Aero-Bus: Take the Bus at the sidewalk near the Arrivals, and exit the bus at the "Avenida da República" bus stop. Aero-Bus runs every 20 minutes from 7 AM to 9 PM. Cost is approximately 3 Euro, and travel time is 20-40 minutes depending on the traffic. It takes about 5-10 minutes walk from the bus stop to IST. Taxi: Cost is around 8 -10 Euro (depending on the hour, and if luggage boot is used). Travel time is 15-30 min depending on the traffic. Hint: take the taxi at the Airport Departure side (instead of taking it at the Arrivals, where the taxis line up for some time hoping for a long ride; for this, you need to go one floor up). Most taxis are beige but some are black and green. All are metered. Whatever means of transport you choose, IST is easily reachable. Take any public transport that passes near "Alameda" (D. Afonso Henriques) or "Saldanha". Several bus lines pass near IST (16, 18, 20, 22, 26, 33, 42). A single bus ticket costs 1.00 € and 3 days ticket costs 5.65 €. A single underground ticket costs 0.65 €, ten single tickets cost 5.10 € and a 7 days underground ticket costs 4.80 €. A one day ticket for both underground and buses costs 2.75 €.